As our civilization advanced technologically and through the passage of time, the earth experienced a gradual decline....... Unexpectedly, this vast earth came to a surprising halt. Suddenly Super Monsters unimaginable to the human mind began to appear all over the world! This crazy universe gave birth to these quick transforming Supercreatures!!!! Super Monsters that would mercilessly destroy building after building. Super Monsters that would ignore the frenzied panic of the people. No human military came close to their power! Eventually, the ultimate natural destruction site, "The Land of Civilization," became the final battleground for the 4 victorious Superpower Monsters. --From the SNES King of the Monsters instruction manual. 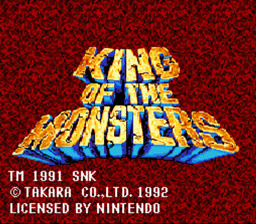 Play King of the Monsters Now!